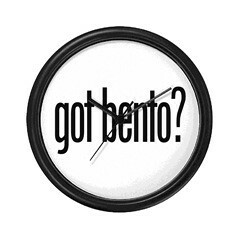 You know what's faster than a speed bento? One you don't take photos of! 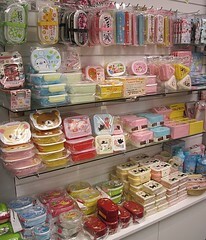 Poll: What bento information interests you? I've been updating the Bento & Lunch Links page, and I'm astounded at the explosion of bento blogs, vlogs, packed lunch websites and cookbooks over the past few years (feel free to suggest additions in comments on that page). 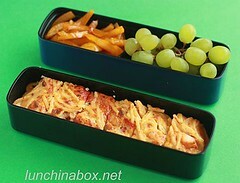 What sorts of posts would you like to see on Lunch in a Box going forward? Take the poll here at Lunch in a Box. I've put together a full update on bento gear stores in San Francisco's Japantown, complete with photos of each store's inventory. 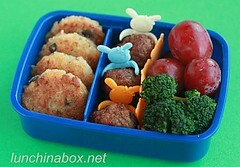 There are some new additions; check it out here at Lunch in a Box. 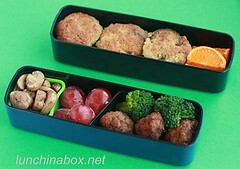 Morning prep time: 20 minutes for two bentos, including cook & cool time. Great way to use up leftover pasta from earlier meals. 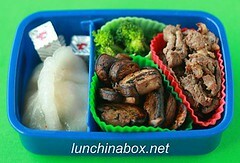 Full details and additional child's version of this lunch are here at Lunch in a Box. 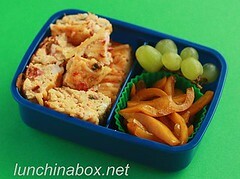 Poll: How long does your schoolkid have for lunch? How much time does your child's school give them to eat lunch? Weigh in on the poll at Lunch in a Box.. Morning prep time: 13 minutes & 10 minutes. 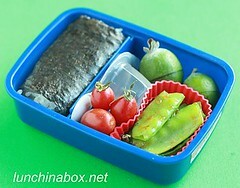 Full details with additional spam musubi lunch here on Lunch in a Box. 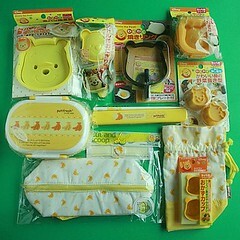 I'm donating a "Winnie the Pooh Goes Bananas" Bento Kit to the Menu for Hope hunger fundraising charity -- US$10 gives you a chance at this bento set. Full details here at Lunch in a Box.